The Texas flag described as a white star on a blue field with the letters TEXAS around the star points is a vexillogical myth. 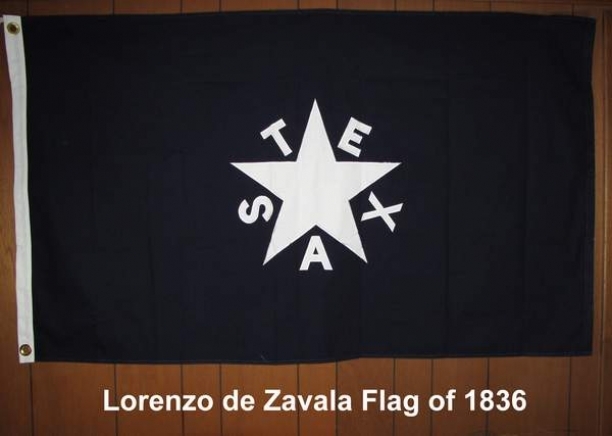 This is the so-called "Lorenzo de Zavala" flag, which Zavala allegedly designed in March 1836 at Washington-on-the-Brazos during the convention that drafted the Texas Declaration of Independence from Mexico and the original Texas Constitution. Zavala was a notable figure in Mexican history-he was one of the three drafters of the original 1824 Mexican Constitution. 3'X5' Cotton flag. Beautiful flag but does not do well outside because of the nature of the fabric.